Snowmobile Russia? 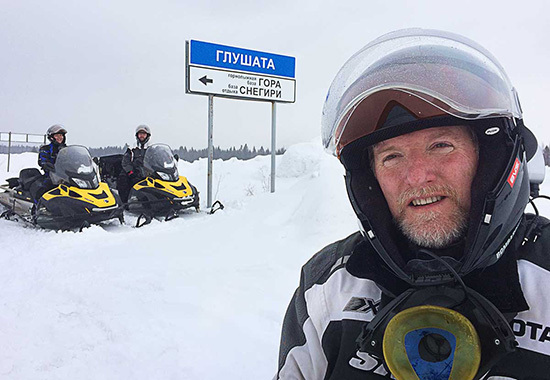 Yes, I snowmobiled in Russia, without a doubt the greatest adventure of my life. The invitation to snowmobile in Russia was on the table for years, problem is, I hate flying. So what changed my mind? Lack of snow at home and two friends named Borodin and Roman. You may wonder how one become friends with snow-loving Russians: simply by chance. Snowmobiling is emerging in Russia, big time. Evgeniy Borodin and his wife Olga recognized the importance of organized snowmobiling, and wanting to better understand the inner workings of snowmobile clubs in the United States and Canada, decided to attend the 2012 International Snowmobile Congress in Sturbridge. In 2011 they sent an email my way, asking if I could find an interpreter while they were at ISC. That’s how I met Roman Shtefan of Westfield, who grew up in Russia and moved to Massachusetts years ago. Roman, who is now a U.S. Citizen, assisted the Borodins during their visit. Evgeniy, I call him by his last name, Borodin, since it’s easier to pronounce, got the snowmobile bug early and has been a professional snowmobile tour guide in the Ural Region of Russia for eons. Since snowmobiling is a universal language, we quickly became friends at ISC. He insisted I fly over and ride with him. I said, “some day” not really convinced I could ever make such a grand trip. Four years later, on March 20, 2016, Roman and I landed in Moscow aboard an Airbus jetliner. The non-stop flight was relatively short, about 9 hours, and only cost $404, round trip. No kidding! As hungry as I am to snowmobile, Roman insists we spend a few days in his hometown, the capital city of the Russian Federation, population 11.9 million. Moscow has a rich blend of historic and modern architecture, it’s beyond impressive. We meet with Roman’s best friends Mike and Max for a night on the town, Moskva style. Our first day consists of a field trip on the Metro, the subway system, which didn’t sound exciting at first. Once underground, that changed. Every station within the city is an art museum unto itself. Each time the train door slid open our senses were overwhelmed by absolute beauty. No litter, no unsettling odors. Instead of ugly billboards there were galleries of paintings, mosaics, sculptures and stained glass… in a subway station! Everyone in the city is dressed sharp and is polite. That night we dined in style aboard a yacht on the Moscow River, floating through the heart of the city under starlight, sipping wine on the Royal Flotilla as it cruises by the Kremlin. The next day Roman decides to sneak me deep inside the Kremlin itself, to see what goes on behind the towers and brick walls. Actually, he bought tickets and hired an expert English-speaking guide to lead us on a tour of the historic compound, which traces back to the 12th century. We stroll past Vladimir Putin’s office on our way to the Kremlin Armory, a staggering museum of antiquities, packed with royal carriages, the gowns of queens, historic armory, treasures and jewels, some dating back to the 5th century. I learn that many of the riches were hidden, mostly buried, before Napoleon’s invasion in 1812. The Russians defeated the world’s largest army by setting fire to crops, stores and bridges as they fled Moscow, thus denying the French army of basic resources. The tactic worked, as Napoleon had to retreat before winter or face starvation. Hungry ourselves, we have lunch at a Cuban restaurant, then walk Red Square, the historic downtown marketplace where the colorful onion domes of Saint Basil’s Cathedral dominate the sky. We witness the changing of the guard at the Tomb of the Unknown Soldier, where the remains of soldiers killed by invading Nazis in the Battle of Moscow are buried. On Wednesday we fly to Perm, a two-hour jaunt east, where the Borodins, whom I haven’t seen in four years, greet us. It was an exciting reunion, magical in so many ways. Day 1: The first day of snowmobiling in Russia is casual, we leave directly from the driveway of Borodin’s suburban home down the snow-packed road into a series of fields. Igor Zapivalov, an expert snowmobiler and jack of all trades, joins us. The ride is familiar in some ways, like at home, except the trails connecting fields are mostly footpaths. After getting somewhat acclimated to the big sleds, we stop for lunch at a rustic farm that serves an amazing assortment of homemade meat dumplings, mushrooms, cabbage and other specialties. From there we travel to the Khokhlovka Museum, which is surprisingly similar to Old Sturbridge Village. The structures date back to the late 1600’s. The log buildings, which include farmers’ huts, a windmill, and several churches, were dismantled from their original locations within the region and reassembled at the open-air museum. The village is anchored by a historic salt manufacturing plant, the economic driver of that period. Only gold was more precious than salt. Back at Borodin’s place we hit the sauna, then enjoy a masterfully prepared feast by Olga. Borodin winds his vintage phonograph, spinning records from the 1930’s and 40’s as we indulge in Russian caviar, moose squares with horseradish and puff pastry inside his impressive man-cave. We stay up late, maybe too late, listening to Moscow Nights and other Sinatra-esque recordings from back in the day. Day 2: This is where the adventure starts, as if traveling to the other side of the world has been anything but. Igor’s Dodge Ram Power Wagon is packed and hitched to the four-place trailer. He points to the truck and in a thick accent say’s “Hemi.” Trucks like this are non-existent in Russia. It costs more than double what we would pay at home but it’s one of the few vehicles that meet this motorhead’s needs. Snowmobiles are expensive too, the average price in excess of $25,000. On the way we stop at a roadside vendor, picking up a bouquet of fresh birch branches with leaves still attached and a gallon of bright green fruit drink which I found out later was actually windshield washer fluid. I have no idea what the bouquet of sticks is all about. Three hours later, just before sundown, we unload at a ski facility in the town of Kizel, at the foot of the Ural Mountains. It was finally time to ride, or so I thought. Within 50 feet the headlight on Roman’s sled goes kaput. “Hey, this is just like snowmobiling at home,” I say. Neither Borodin nor Igor (pronounced Eager) understands the humor. They flip the hood, grunt, replace a fuse, and away we go down a logging road. Within few miles we see lights, which turn out to be the logging trucks, one stopped with a mechanic underneath. The road is little more than eight feet wide and the snow banks are just as tall. There is no way to squeeze by. Borodin throws his sled into low range and slowly slices a path straight up the vertical bank, making several calculated up-and-down runs until he’s able to crawl up… then disappear. It was dark, I wonder if we might have lost our guide to a black hole. A few minutes later Igor’s two-way radio sounds off with Slavic directives. Igor points at me, shouting my name, “Den-Yell,” indicating it’s my turn. The Lynx Yeti under my fanny is freighted with hundreds of pounds of gear and extra fuel, I have no clue how it handles but I’m guessing like a hippo on skates. I gas-it up the wall, then quickly slam the brakes at the apex. There was indeed a giant hole on the other side, a 40-foot downward slope. Borodin’s flashlight is visible to my left. I follow his path, squeezing through saplings that bow aside to the mighty Yeti. Little did I know that blazing new trails would be the norm. Underway again, the full moon is our guiding light to the Urals. About halfway to camp we stop for a breather. Borodin opens his jumbo saddle bag and presents Roman and I with cork-covered cups, embossed with a polar bear, the seal of Perm. He fills them with hot tea, then delivers a wonderfully warm speech, a toast, welcoming us to his homeland. We arrive at a domed hunting camp in Rassolny, the architecture which resembles the works of Dr. Seuss. It only adds to the “pinch me, is this real” sensation. An hour later Vlad Klekner and Sergey Valeev walk in, just in time for a dinner of traditional borscht soup, fried squid, rice and liver. These guys are off-road adventurers and recently traveled 26-days-straight by 4×4 on an Arctic expedition to the northern most point in Russia. Sergey opens a jar of his homemade pickled cabbage and makes a toast over Armenian liquor with a wedge of lemon. We hit the bunks early, completely psyched for our first day in the mountains. Day 3: In the morning I find Borodin outside draining gas cans into the sleds and contacting home via his satellite phone, our only source of communication. Wired electricity doesn’t exist, a generator powers everything at the lodge. Cell phones? You must be kidding. The trip starts along the banks of the Kosva River, we stop briefly by an enormous rock face for photos, then shoot into the woods, breaking trail in 3-4 feet of snow for an hour-plus. Suddenly Borodin slows, looks around, and points a single finger in the air. We all know this means shift into first gear, low range. We are about to travel into something big. Passing through a line of trees we find abandoned homes, half buried in snow, many crushed to the ground. As we slow, Serg runs into a dilapidated barn, toilet paper in hand. Not a good sign. We travel further into the lost settlement of tiny log homes. Parking our sleds on Lenin Street, the main drag in the former Soviet town of Bolshaya, we take in the beauty of Oslyanka Mountain. I explore a few deserted cabins in the ghost town while Igor calls back to Serg by walkie-talkie. Igor, who speaks some English, says “not good.” I dig into my bag of tricks for Imodium, something I never travel without, and hand it off to Igor, who delivers the goods. Talk about building international relationships, Sergey and I are now friends for life. You could say I did him a solid! With that behind us we ascend Oslyanka. It goes from gentle incline, to steep, to vertical. There isn’t a trail or marker in sight. Borodin advises to follow his path and never get off the throttle. I go second, barely keeping him in sight. The depth of snow varies from a few feet to bottomless. Woot! It becomes apparent that a few in the group are stuck somewhere below. Borodin and Igor go back to help, leaving me atop a mountain ridge in Russia, all by myself. I hope they come back. Everyone finally makes it to the ridge, just above the timberline, where we break for lunch. Dark bread with a distinct molasses flavor is complimented with slices of soft cheese, almost butter-like. I ask what kind of cheese is this? They are amused by my limited palate. It’s sliced pig fat, I’m told, smoked to perfection, a high energy snack. I’m so hungry I pretend not understand and simply enjoy my cheese. Stuffed like hogs, we ride up a never-ending slope into the heavens. Visibility decreases rapidly but Borodin leads us through a lunar surface of snow, rock and ice, piloted by his sixth sense of terrain interpretation. The line between earth and sky disappears in fog, when a couple of dark objects make their omnipresence known. At the peak are several rock formations, somewhat reminiscent of Stonehenge. We celebrate as if we discovered the prehistoric monument for all mankind. Back at the dome dinner brings a few surprises. The table is decorated with pickled onions and cabbage, and whole salted fish, as in uncooked with eyeballs staring back at you. Delicious, I say! Sergey supplies the entertainment, plucking an acoustic guitar, as we move on to a bowl of log-man stew. They tell me that a spoon will stand up on it’s own if it’s good stew, and it does. What I thought was dinner was apparently nothing more than a snack before the banya, a traditional wood-fired sauna with an adjoining room to hang out and continue the feast. After sweating it out, my new friends run outdoors and dive into the snow. Crazy Russians. Not to be outdone, I follow suit. That’s when they ask if I’ve ever had a real banya? It takes little more than a blank stare to answer their question. Back we go into the 199 degree sauna, except this time they are beating the daylights out of my back with those mysterious birch branches which are dipped in boiling water the moment before impact. The ritual continues, this time drenching the tree limbs in ice water and whacking some more. It’s invigorating, it improves circulation, and it dates back to A.D. 906. In case you missed it, banya night consist of food and more food. Sergey slices cold-smoked deer meat that he hunted and prepared himself. He’s proud to share with us. The conversation of the day’s snowmobile adventure quickly turns to stories from past rides. Borodin listens as Vlad and Igor tell jokes. Roman is interpreting as fast as he can. Later we hang outside in our shorts, barbecuing chicken and pork, as if it’s a balmy July evening, not 15 F. These guys love winter. Day 4: Vlad and Sergey head home while the rest of us prepare for an overnight saddlebag trip deep into the Ural Mountains. Not long after veering onto a cart road we find a group of cigar smoking sledders. This will be the last time we meet other snowmobilers. We stop, and of course they all know Borodin. We’re in the middle of nowhere and yet he knows everyone! Turns out he’s guided them on several snowmobile expeditions before, introduced them to this very riding area. They easily figure out I’m from the United States, then insist we have a toast of vodka. Truly a warm welcome but I still had bacon caught between my teeth from breakfast, and we don’t drink on the trail, so we politely decline. Continuing on the cart road we come at a halt where the trail cuts across a shallow valley. This is the geographic border separating the continents of Europe and Asia. We are riding Babinov Road, established in 1597. It was the first direct route linking Moscow to Siberia over the Ural Mountains, opening trade and allowing Russia colonization of the region. Tsar Feodor, son of Ivan the Terrible, was so impressed with the flow of commerce that he excused Artemy Babinov from paying taxes ever again. It’s safe to assume the famous explorer never imagined that snowmobilers from the other side of the planet would be indebted to his trail 419 years later, but we are. After cruising in fresh snow for a period far longer than I’m accustomed to, Borodin slows, then cuts to the right, directly into the brush. We follow him, aiming the sleds towards a distant stand of trees, then into a field, discovering another abandoned village of log homes. This one far more deteriorated than the other, and the snow is getting deeper. A half hour passes and Borodin slows again. He stares at his handlebar mounted GPS, looks back at us, then disappears into a narrow gap between the evergreens. If we were boondocking before, what the heck are we doing now? I understand there are no trails in this part of the world but this is extreme. There isn’t a single clue of anyone ever traversing here, we are making our way through thick forest, muscling the machines between obstacles in the narrowest of space. The trees open up a bit and we pop onto a cart road, but there is a 15-foot wide washout, about four feet deep. Shifting into low range, we ever so gracefully crawl down the ledge into the rocky stream. It takes Borodin several attempts to break the steep snowbank on the other side, which makes it easier for us. Igor, who takes up the caboose in case anyone needs help, crosses last. His Ski-Doo smells like a roadside grill and it isn’t some new 2-stroke oil. It’s time for shish kabob, cooked to perfection on Igor’s exhaust pipe, some of the best I’ve ever had. The average elevation hovers around 1,000 meters today, about that of Mount Greylock’s peak. The snow deepens to the point that we have to stand to keep the sleds from tipping. We are riding 156-inch long, wide-track sleds with fully articulating rear suspension, the epitome of stability, yet it feels as though we are performing an Olympic routine atop a balance beam. Terrain varies from hilly meadows to dense stands of trees. It’s snowmobile heaven. It’s sensory overload. This is snowmobiling in Mother Russia! A stop for tea traps us in waist-deep fluff. Jumping up and down drills you to armpit depth instantly. In order not to drown, one must walk on snow already packed by the Camoplast tracks, but even then gravity plays a dirty trick once in a while, pulling you to the other side of the earth, which in this case, would be somewhere near Massachusetts. An impressive monument welcomes us to Kytlym, a rural village of log homes contrasted by a backdrop of modern apartments, about 160 miles west of Siberia. Our rustic cottage is heated by a traditional Russian oven in the center of the living quarters, complete with a warm teakettle. We settle in for a home-cooked meal presented by the innkeeper. It’s been a long day, I inquire about the facilities. I’m told to go out the front door, take a right towards the banya… and there you go. So, I grab my favorite snowmobile magazine, take a few steps towards the door and find myself being ridiculed with laughter. Seems I misjudged the opulence of our lodging. I was given a flashlight and a roll of paper, then warned not to lose my balance once inside the outhouse. Balance? I don’t recall the travel brochure mentioning this. With that over, I settled in for the night, dozing off in a wood-heated cottage with a giant bearskin tacked to the wall. Day 5: There is nothing like waking to six inches of fresh snow, especially if you have nothing better to do than ride all day. Snow is already halfway up the windows of our cottage and piled 6-8 feet high along the castle-like palisade fence. There isn’t a snow blower in sight, only shovels. The ladies that run this place are to be respected. My breakfast consist of three eggs, six pieces of ham, a loaf of bread, crepes with sour cream and tea. Igor and Borodin eat fried eggs in one gulp, an efficient technique I’d never seen before. I couldn’t eat a fraction of it, then became concerned about the ability to lace my boots without injury. Today we play in the big-boy sandbox. It starts on what I would describe as the world’s longest set of power lines. The territory is vast, it goes on forever. We simply ride wherever we want – wherever it makes sense. The terrain is a hilarious mix of mounds and gullies, an infinite playground of fluff. Roman, who is off to my right, vanishes. It looks as though he got sucked into the center of the universe. There must have been juniper bushes far below that gave way. Igor radio’s Borodin to wait up, we had a major extraction to perform. With a manufacturer’s dry weight of 700 pounds, plus the custom gas rack and gear we schlep, this Super Wide-Track weighs at least 1,000 pounds, which sounds far worse than 450 kilos these guys are estimating. Panting like Siberian Huskies in August, we strip down to our t-shirts and swear in Russian – which sound really bad – until we finally coax the winter mule free. The rest of our day is spent exploring high elevation meadows with a few long breaks for socializing, which can be somewhat like a game of charades. The rules do allow drawing stick figures in the snow. Borodin has a subtle but deliberate sense of humor, which pretty much describes his snowmobile philosophy. He is prepared to the max, yet unfazed by dips in the trail. He wishes fellow snowmobilers would organize like SAM and develop a trail system but most don’t understand the benefits yet. In that regard, he is a pioneer in his country. Before heading back to camp we fool around, carving corners, laying the sleds over on the side, with several notable fails. These big rigs were never intended to be play machines and the added weight of supplies only amplify their utility roots, but it’s fun. Roman and I agree, we are coming back in 2017. Day 6: The logging road on the return trip is freshly groomed… but wait, there aren’t any groomers here. We zip along for miles, carving our way along the only real trail of the entire week. Next to a stack of logs is a bulldozer. My comrade Borodin, anticipating that a week of logging operations would have turned the road into a rutted mess, arranged to bulldoze the entire trail for our final ride back. He truly is the Tsar of the Ural Mountains. Roman and I wing back to Moscow for one last night before going home, taking in the opera Carmen at the world famous Bolshoi Theater. The words “opera” and “snowmobile” aren’t often mentioned in the same story-actually this may be the first time ever-but it was nothing short of a spectacular cultural experience, another unforgettable moment. They say it ain’t over until the fat lady sings and nothing could have been closer to the truth. I think she waved goodbye. Are you interested in snowmobiling in Russia? You can connect with Borodin at snowmobilerussia.com.